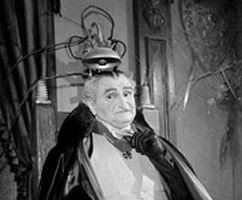 Since it's Halloween, I thought we should take a more expanded look at one of the members of the TV Crossover Hall Of Fame - Grandpa of 'The Munsters', inducted in October of 2008. 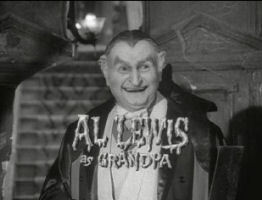 There are those who think he's "Grandpa Munster", in much the same way they think that Daisy Moses is "Granny Clampett", but both those last names belong to their sons-in-law, Herman and Jed, respectively. Grandpa's name is now Sam Dracula, but some people consider him to be Count Dracula - Herman's boss even addressed him as such once. 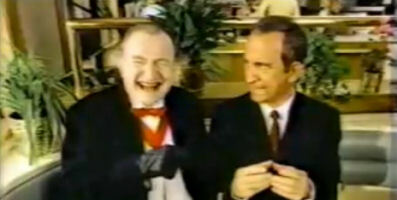 And although Grandpa might accept that honorific out of egotism, he is NOT Count Dracula. 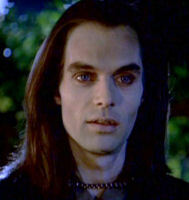 Grandpa was embraced into the Kindred of the Dracule, and so now bears the family name in honor of his sire. But he's not Vlad Tepes. We met Vlad the Impaler in his mortal form in the TV movie "Dark Prince" and as his vampiric Majesty in the "Buffy vs. Dracula" episode of 'Buffy The Vampire Slayer'. Grandpa may be a Dracula, but he's pure New York, with his accent and his attitude - more Brooklyn and the Bowery than Bavaria. And yet the gravestone he keeps in his car says he was "born" in 1367. None but the Amerinds were in the New York area back then, so how could he be in such a New York State of Mind? Eventually his travels - both temporally as well as geographically - landed him in the Transylvania area before 1367. There he fell in love and settled down, eventually fathering a daughter who was named "Lily". And then his path crossed that of Count Dracula in 1367. 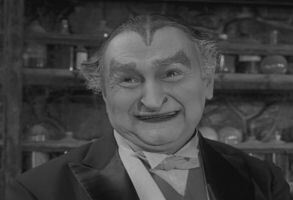 From that point on, Sam Dracula's life would be as it was recounted in the many episodes of 'The Munsters' - with his daughter Lily being embraced as a vampire as well. But who was Sam Dracula in his mortal life before he was embraced? Realizing that the heat was on because of the Giovanni investigation, Sam Carrari may have panicked and utilized that time machine to escape into the past. 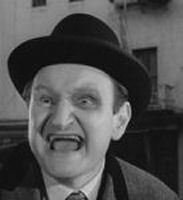 Al Lewis played other roles in 'Naked City' and I was tempted to choose Harry McGoglan from "A Corpse Ran Down Mulberry Street". The basic plotline sounded perfect - a truck crashed into a hearse and then the body inside got up and walked away from the accident. 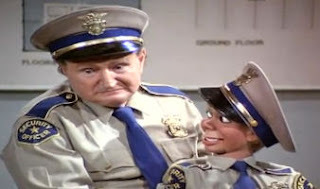 It turned out to be part of an illegal immigrant scheme - this was a fairly realistic cop show, after all. But wouldn't it have been the type of situation which could have involved the future Grandpa - reanimating the dead perhaps? As for those other roles on 'Naked City', maybe they were "identical cousins" to Mr. Carrari. Maybe they were all Sam in disguise. Who knows? Maybe Carrari whipped up a "Multiplicity" potion which created those five doppelgangers? 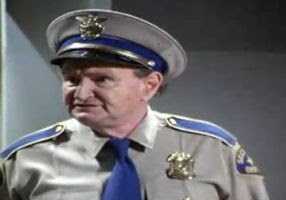 But whoever those five other Al Lewis characters were on 'Naked City', there had to be something about them that differentiated them to the detectives, if not to the TV audience. 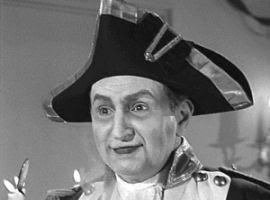 As long as that list was, as Sam Dracula he must have met thousands of TV characters throughout History since 1367, both famous and non-famous. Far too long a list to compile even the usual suspects, but I think he must have at least encountered the Time Lord known as the Doctor - if only to guide Grandpa away from any potential cataclysm to the time-stream should he meet himself as Sam Carrari. Then there's his life after 'The Munsters'. It could be that Grandpa wanted a return to the anonymity of his past life; that could be the reason he took that night watchman job. There, he could use an alias (Alex called him "Henry") and not be bothered by fangbangers when the next wave of vampire fandom swept the nation. Alex met "Henry" in 1981, and Henry said that he had been on the job for twenty years. This was either a lie to protect Grandpa's cover story, or it just felt like twenty years by that point. SKED ALERT! - TONIGHT'S "BOARDWALK EMPIRE"
THE MUPPETS - COMING THIS THANKSGIVING!